"Marriage" which is the primary institution of procreation of children and following the ritual rites. In India Marriage is one of the most essential institution which gives primary rites to the souses. In some religion like Islam marriage is a civil contract but in Hinduism it is more about affection, ritual ceremony and one of the dharma of a person. But you cannot deny by stating that current legal philosophies have made marriage as civil contract under most of the religion. A pious tie of a marriage comes to an end by the legal weapon which is known as "Divorce". The word Divorce is a gift given by the legal evolution in the society. In Hinduism there is no such words or weapon can break this pious knot of marriage. By the passing of time the cultured and educated society of Hindus understood the dire need of "Divorce" which resulted in the introduction of Hindu Marriage & Divorce Act, 1955. "A spouse suffering from Mental Disorder cannot be the sole ground for dissolution of marriage. A bench headed by Justice GS Singhvi said divorce can be granted only if the illness is of such nature that it is difficult to live together. 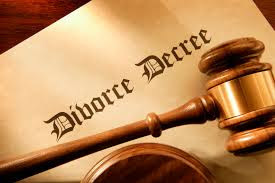 Turning down the plea of a man seeking divorce on the ground his wife was suffering from schizophrenia, the bench said the existing Hindu Marriage Act (HMA) did not make existence of a mental disorder of any degree sufficient to grant divorce. "if the mere existence of any degree of mental disorder could justify dissolution of marriage, few marriage indeed survive in law. Mental disorder of the husband even if proved, cannot by itself "Warrant a Decreed of Divorce". It must be further proved that it is of such nature that the wife could not be expected to live with the husband. Trial irritations, quarrels and usual wear & tear of a married life would not be adequate to grant divorce on the ground of mental cruelty. Married life should be reviewed as a whole and a few isolated instances over a period of years will not amount to cruelty"
In August 2013, the Supreme Court has ruled that "temporary ill-health including Schizophrenia cannot be a ground of Divorce u/s. 13 (1) of Hindu Marriage Act, 1955. The Bench of Justice G.S. Singhvi &i Justice V. Gopalwada held "under Hindu Law, marriage is an institution, a meeting of hearts and minds and is something that cannot be taken lightly, further any person may have bad health this is not their fault and mostly it is not within their control".